Latvia, a country in the Baltics in Northern Europe bordered by Estonia, Lithuania, Russia, Belarus, and the Baltic Sea has a total land area of 24,938 square miles and a population of around 2.2 Million. Located on the East European Plain, its fertile low lying plains is blanketed by forests (mostly oak, linden, and pine). Though it has been ranked among the poorer members of the EU, its successful privatization efforts have led to a prosperous private sector. The major economic sectors are petrochemicals, timber, agricultural products, and manufactured items. June through September is the best time to visit this Baltic Region with numerous nature parks and trails. The World Heritage Site Riga is by far the biggest crowd puller. Liepaja, Karosta, Kuldiga, Cesis, and its sea coast with white sandy beaches are also popular with tourists. Depending on the season it offers hiking, cycling, boating, skiing, snowboarding, kayaking, swimming, and strolling. Latvian cuisine is based on local produce and it is at its best in the bread and diary departments. 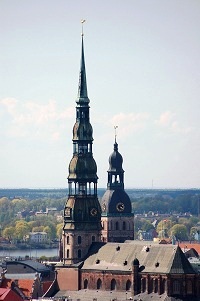 Latvia Bradt Travel Guide 978-1841622019 $24 Excellent overall travel information. Background and practical information covering 60 pages followed by region-wise coverage on Riga, Near Riga, Vidzeme, Kurzeme, Zemgale, and Latgale and the Daugava River Valley. Latvia Michelin Map 978-2067128446 $10 Driving focused with distances and times. The first stamps of Latvia were a set of two stamps released on December 18, 1918 in the Arms theme. They were printings with no watermark on the backs of German military maps. The set (Scott #1 to #2) is inexpensive and catalogs for around $2 mint or used. This set was followed by another set of six stamps (Scott #3 to #8) in the same theme in 1919. That set catalogs for around $14 mint or used. Varieties on the Arms theme continued for the rest of the year. A few other designs also appeared in the same year – Liberation of Riga, Rising Sun, and a design showing an allegory of one year of independence. Following Germany’s defeat in World War I Latvia became and independent sovereign state. Liberation of Riga was a key event in the battles for Latvia’s independence. Latvia was part of territory transferred to Germany following the Treaty of Best-Litovsk signed between Russia and the Central powers on March 3, 1918. The liberation and arms themes along with overprints on earlier issues were the primary stamp issues of Latvia until 1923. The Arms set of 1921 (Scott #101 to #112) is especially valuable at around $100 mint and $20 used. Latvia released a set of six stamps on November 18, 1928 to mark the 10th anniversary of Latvian Independence. The set (Scott #158 to #163) catalogs for around $12 mint and $4 used. The designs show views of the following cities: Rezekne, Jelgava, Wenden, Libau, Riga, and Riga Theater. A set of eight stamps released on May 13, 1939 to mark the 5th anniversary of National Unity Day. The set (Scott #207 to #214) catalogs for around $20 MNH and $10 used. The designs show school at Riga, Castle of Jelgava, Riga Castle, Independence Monument at Riga, symbol of freedom, Community House of Daugavpils, Powder Tower and War Museum of Riga, and President Karlis Ulmanis. May 15 was celebrated as the National Unity Day in Latvia for 5 years starting May 14, 1934. That was the day Karlis Ulmanis established authoritarian rule in Latvia following a coup. During World War II, Ulmanis was forced to resign on July 21, 1940 following Soviet occupation. He died in a Soviet prison in Krasnovodsk on September 20, 1942. Following World War II, Latvia became a part of the Soviet Union and stamps of Soviet Union were used from that point on. A set of eight stamps released on October 19, 1991 in the National Arms theme. The set (Scott #300 to #307) catalogs for around $12 MNH or used. Following a referendum on March 3, 1991 in which 73% of all Latvian residents supported independence; Republic of Latvia became fully independent on August 21, 1991. A set of six stamps released on April 29, 1993 in the Traditional Costumes theme. The set (Scott #343 to #348) catalogs for around $20 MNH and $15 used. The designs show Kuldiga, Alsunga, Lielvarde, Rucava, Zemgale, and Ziemellatgale. A set of four stamps and a souvenir sheet released on January 7, 2006 showing Latvian Europa stamps to mark the fiftieth anniversary of Europa stamps. The set (Scott #633 to #636 and #637) catalogs for around $4 MNH and around $2 used. Several Europa stamps were released by Latvia over the years forming a good collection theme. As the issues are recent, they are inexpensive as well. The first coins of Latvia were Bronze Santims (100 Santimu = 1 Lats) issued in 1922 showing National Arms above Sprigs in Obverse and Value Dividing Sprigs above Date in Reverse. The issues have high mintage (>5M) and catalog upwards of $8 in UNC. Following the dissolution of Soviet Union, Modern Republic era coinage debut in 1992 with the introduction of copper-plated iron Santims in 1992. Those issues are not especially valuable and catalog for well under a dollar for UNC. Latvia started issuing gold proofs in 1993. The first issue was to commemorate the 75th anniversary of independence and showed Arms with supporters in Obverse and an artistic lined design above value and date in Reverse. Latvian Gold Proofs are generally valued at a slight premium over bullion value. Coins $1 and up Common Santimis from the 1990s onward in BU start around $1. Early Santimis from the 1920s in XF start around $10. Silver Coins from the 1930s onward in UNC, and certain rare early varieties in XF start around $30. Early Silver Coins in UNC, Recent Commemorative Proofs, Year Sets, etc start around $50. Low mintage silver proofs and gold coins go well into the 100s. Paper Money $3 and up Common UNCs from the 1990s onward start around $3. WW Issues in VF start around $10. Russian Era UNCs and certain error varieties from the 1910s, high values from the 1930s onward in XF, etc start around $40. Early large note UNCS, recent bundles, etc go into the 100s. Jewelry, amber, ceramics and chocolate are the typical souvenirs of the place. Antiques $10 and up 19th century maps start around $10. Soviet Latvia Figurines start around $50. 18th century and prior maps start around $100 and go well into the 100s. Art $5 and up WW posters, Ex Libris bookplates, etc start around $5. Original works by Valdis Buss, Thomas Kinkade, etc go well into the 100s.